Sean-o here. Yesterday held the dual milestones of entering Oregon and crossing mm 1700. Today featured a different kind of anticipation as we marched toward Ashland and a rendezvous with Dionysus's parents, Diane and Scott, visiting from Colorado. As it turned out, the reunion was most timely for us. Pan had a bad night, a pretty high fever and night sweats and digestive pyrotechnics through the night best left to the imagination. We got up early, hoping to make the 18 miles to Callahan's by noon or so. But Pan was feeling worse and worse, so we called S & D and asked if they could extract us at Mt. Ashland Campground, nine miles short of our goal (we'd make up the lost miles by having them return us to Mt. Ashland Campground after our rest in Ashland). 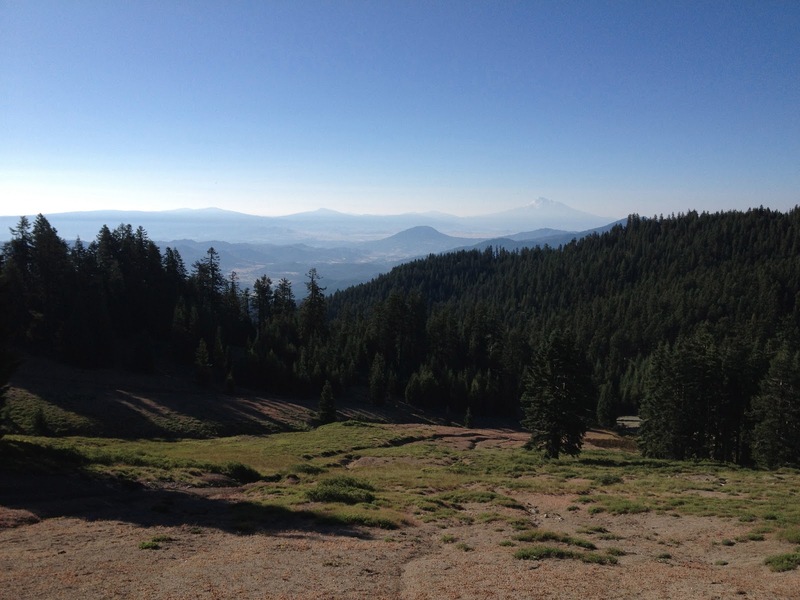 Looking south on our morning hike, back toward Shasta. Pan was pretty wiped out by the time we got near the campground. We descended the beautiful trails -- Pan focused on making the miles while he had energy, and Dionysus and I following a little more slowly. A little more than an hour later, we were in their red Yaris rental, headed for town food (delicious Thai cuisine) and clean sheets and Pepto Bismol. Pan tried to rally but just kept getting worse, so he decided to go to the ER (at Pan's mother's urging). Scott drove him to the Ashland Community Hospital where the doctors did some tests and hooked him up to an IV due to dehydration. The doc figured it was a bacterial infection in the bowels and put him on Cipro. Pan was feeling much better by the time he was released about four hours later. We went back to the motel and flopped down in Scott & Diane's room to catch up on the Olympics. ~~oh what fun the Olypics were! Under the circumstances, it was both reassuring and delicious to leave the the trail for such warm and welcoming family time. Thank you Scott & Diane!